Quentin Tarantino directs this Academy Award-winning western starring Jamie Foxx as a freed slave who sets out to rescue his wife from a merciless plantation owner. 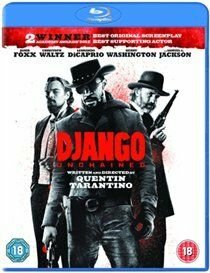 Django (Foxx), a slave with a violent past, earns the favour of bounty hunter Dr. King Schultz (Cristoph Waltz) when he helps him kill a trio of infamous murderers. Schultz frees Django and begins training him as a fully-fledged bounty hunter. The pair enjoy further success tackling some of the American South's most troublesome criminals, but Schultz gradually becomes aware that Django has motivations beyond earning a reward - Django has been searching for his wife, Broomhilda (Kerry Washington). When the duo discover that she is enslaved to the ruthless Calvin Caddie (Leonardo DiCaprio) they begin hatching a plan for her rescue. However, with Caddie's employees numbering the vigilant Stephen (Samuel L. Jackson) and mindful bodyguard Butch (James Remar), it may well be the pair's biggest challenge yet. Christoph Waltz won the Academy Award, a Golden Globe and a BAFTA for his supporting performance, while Tarantino won the Academy Award, a Golden Globe and a BAFTA for his original screenplay.